Everything started at the beginning of 2011! In January of 2011, I came in contact for the first time in my life, with the lovely breed “AKITA INU”. I was so fascinated with the breed that I have told myself that one day I would like to own one of these dogs. Very Soon after, my dream came true. In October 2011 I got my first Akita. New life, new rules, new responsibilities. Since 2011 I give all my free time and love to this female Akita, called ISAKO of SHOHAGO aka Isako! Isako it was the beginning for me to start learning and reading about the breed. I participate in Dog Shows in Cyprus and even travelled with her breeder Panayiotis Tsingos at the European dog Show 2012 in Bucharest to compete with excellent results. Also observing various dogs in countries gave me the boost to start dreaming about my future plans for this amazing breed. Now, I would like to introduce you, my kennel name “KIN MI HOSHI”, situated in the Mediterranean island of Cyprus. 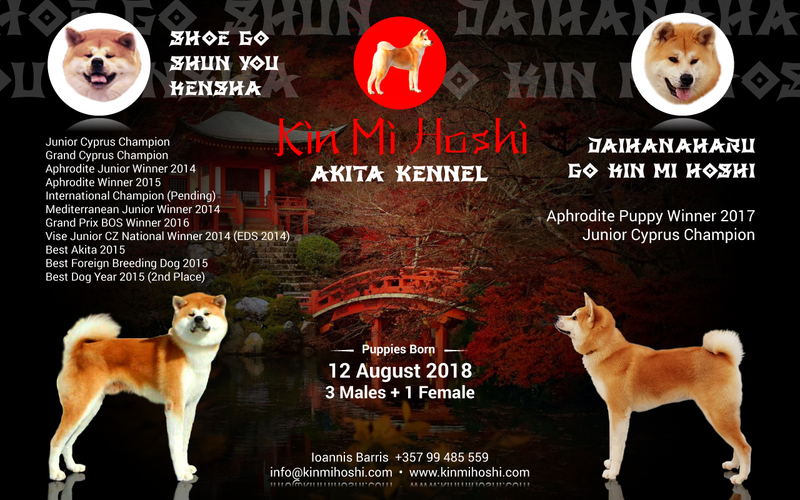 “KIN MI HOSHI means in Japanese “Beautiful Gold Star” and it’s dedicated to my first Akita “ISAKO of SHOHAGO aka Isako”. I would like to welcome you all to our web site and I encourage you to take a look of what we did in the past, what are we doing now and what our plans are for the future. Welcome to our web site once again! For any information or clarifications you may need I am at your disposal.